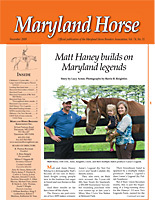 Matt and Amie Haney belong to a demographic that’s become all too rare in Maryland – bright, young people new to the business but eager to breed and race horses in this state. And their results so far have been off the charts. The Haneys are part-owners of two 2009 stakes winners: Amie’s Legend (by Not For Love) and Sarah Cataldo (by Smarty Jones). They also own, on their own account, the 3-year-old filly Saar Treaty (by Saarland), a $50,000 Keeneland November weanling purchase who was runner-up in last year’s Missy Moo I Love You Stakes at Belmont Park. Their broodmare band is sparked by a multiple stakes producer: Amie’s Legend’s dam Lunar’s Legend (by Polish Numbers). But if their vision becomes reality, this is just the beginning of a long-running story for the Haneys’ 112-acre Two Legends Farm, named for the stars of their racing stable and broodmare band and located in Maryland’s horse breeding mecca of Chesapeake City.